Choose Your Mongoose Promotion – Get what you desire! Important notice: This program will start on 6 August 2018 and will be available to all registered players at Mongoose Casino. Once players have registered and activated their account, they have 3 Promotional Package options, No Promo, Bonus Package or Cash Kickback. Mongoose Casino lets you choose on how you want to get rewarded on a weekly basis by offering players 2 promotional options. This promotional option is in addition to the standard bonuses that all players receive upon sign up and/or deposit. If players choose the No Promo option, they are only eligible for No other bonuses and promotions offered at Mongoose Casino except for the standard Welcome Bonus. The reward or bonus level is based on the player tier/loyalty level, which is upgraded manually by our team every first week of the month. Each of these promotions are subject to their respective terms and conditions. At Mongoose Casino, we definitely like to punch in as many bonuses as possible which is why our Bonus Package offers a wide variety of bonuses on a weekly basis. Depending on your weekly activity, players might be selected to jump up on the VIP tier (starting from a Newbie, all the way to being a Platinum player) and get more rewarding bonus packages as a result. While Cash Kickback offers players straight up cash on a weekly basis based on their activity, bonus package offers players progressive bonuses based on their activity. As players progress through the ranks, they will be receiving bigger and better weekly promotions in the form of various bonuses. Every month players can climb up on their VIP tier level, based on their activity, and are offered more attractive bonus packages on a progressive basis. Once players register and activate their account, they are automatically ted in as a Newbie and as they work their way up the loyalty program, they are rewarded more attractive bonuses. Players who select this promotion option are offered various bonuses such as Free Spins or Deposit Bonuses on a weekly basis. Players are able to claim these bonuses and are required to fulfill the wagering requirements as per the terms and conditions of each bonus offered. 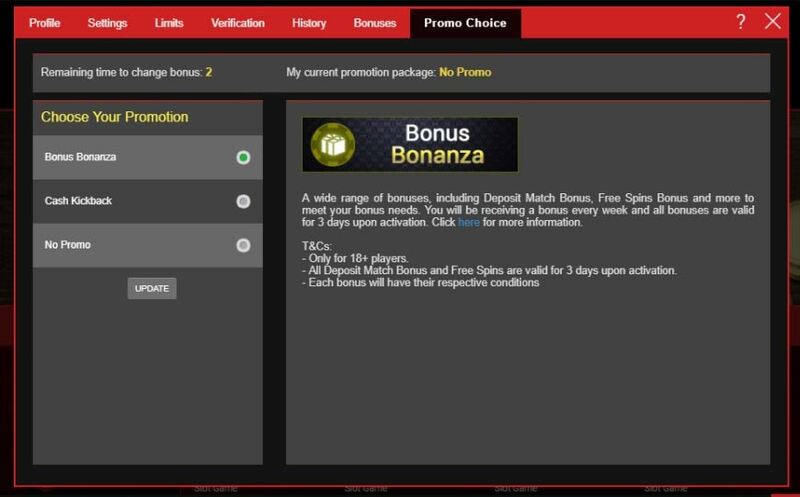 Each weekly promotion as part of the Bonus Bonanza will have their respective terms and conditions. Like other loyalty or reward programmes where you acquire points on purchases you make, we at Mongoose Casino offer you the same whenever you play on our slot games. As an alternative to exchanging your points for prizes or other other bonuses, we give you back your rewards in cash, which is transferred directly to your player cash account. With the Mongoose Casino Cash Kickback, you can earn your share of up to 25% casino cashback on all spins – that’s cashback on all our slot games (excluding jackpots). The more you wager, the bigger the portion you receive. Throughout your lifetime as a player, the team at Mongoose Casino monitors your game-play and will adjust your cashback rate accordingly, so if you’re a Platinum player, you’re eligible for a cashback of up to 25%. We give back a daily percentage of what the house makes from all our players. The portion of cashback awarded to you is based on the amount you have wagered, which means the more spins you make, the more you get in return.